"Booth after booth of all hand-crafted items...art, jewelry, crafts, textiles, edibles, and more!!! Admission is $5 per person or $3 per person and 2+ cans of unexpired food. Food donations will benefit Harvest House. Kids 12 & under are free w/paid adult. Strollers welcome!!! Free Parking!!! AND, there's a playground for the kids :)"
Admission is $5 per person or $3 per person and 2+ cans of unexpired food. Food donations will benefit Harvest House. Kids 12 & under are free w/paid adult. 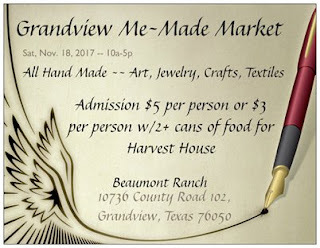 No manufactured or direct sales items at this event. $10 application fee. If application is approved, booth payment is due within 7 days. Notice will be given within 7 days of application being received. If accepted, you will receive an invoice for the event and you will have 7 days to make the payment. If payment is not made, the invoice will be cancelled. All booth fees and application fees are non-refundable.